Undeterred by heavy volcanic activity or any geographical upheaval, Taman Negara stands tall and majestic as one of the worldâ€™s oldest existing pristine rainforests. No wonder it is felt that a trip to Malaysia is incomplete without a trip to Taman Negara. The worldâ€™s oldest tropical rainforest, Taman Negara is acclaimed as one of the greatest natural wonders of the world. Taman Negara's flora and fauna has evolved naturally over hundreds of millions of years without any disruption or major calamities. Taman Negara in Malay means National Park. Taman Negara covers over 4,343 sq kms of primary forest and is spread across 3 states. It is located in the Tahan Range and has Mount Tahan, the highest peak on Peninsular Malaysia, at 2,187 meters. This splendid lush green region is a haven for endangered species such as the Asian elephant, leopards and rhinos, tigers, etc. The jungles at Taman Negara are so dense that you could pass within meters of an animal and not even know about it. Formerly known as King George V National Park, this park was declared a national park in 1939 by the three sultans of Kelantan, Pahang, and Terengganu. It was so declared in order to protect and preserve the flora and fauna indigenous to this area. The history of this Park dates back to 130 million years. It has not been disturbed for millennia and remains the habitat for various types of flora and fauna, untouched. Even though this park is a popular tourist attraction of Malaysia, the government of Malaysia has taken all steps for careful conservation of the forest. Taman Negaraâ€™s tropical rainforest is one of the most complex and richest ecosystems in the world. This park is home to around 10,000 species of flora, 150,000 insects, 25,000 invertebrates, 675 birds, 270 reptiles, 250 freshwater fish and 200 mammals. The most interesting aspect is that scientists are discovering new species every day. The lush green pristine vegetation and trees form a giant canopy. Right at the centre of the park is located the peninsulaâ€™s highest peak. You can also find numerous limestone hills covered with the thick forest of Taman Negara. Taman Negara, at times gets noisier than any other big city; the cacophony of insect noises, birdcalls, and animal cries continues night and day. The park is home to the original inhabitants of the area, the Orang Asli people. Few of their people still lead a traditional semi- nomadic lifestyle of farming, fishing and hunting. They are the only people allowed to hunt and scavenge in the park. The park covers parts of three states Pahang, Terengganu and Kelantan and thus there are several main point accesses. The most visited part is Kuala Tahan in Pahan State. Cave exploration: Gua Teliga (Ear Cave) has rock formation in the shape of an ear. Gua Kepayang and Gua Daun Menari (Dancing Leaves Cave) are limestone outcrops and you can also explore the animals and insects that live in these caves. Bird watching: There are over 350 species of birds in the park. Whitewater rafting: Rafting on these rivers can be really adventurous. Fishing: There are as many as 300 species of fish in the rivers. Jungle trekking: You need to take a guide on all long trekking journeys. Taman Negara is a perfect place for trekkers as there are numerous jungle trails and with the help of guides, it is easier to explore the wilderness of this place. Mountain climbing: You will have to be physically fit to climb the mountain. You need to carry your own food and tent for this 4-7 day journey to the top of the highest mountain in Peninsular Malaysia at 2,187 m. There are chances that you migh spot elephants in the wild. Rapids shooting: Traveling upstream on Sungai Tembeling from Kuala Tahan is an exhilarating experience. Canopy walk: Explore the forest canopy passing through a suspended walkway high above the rainforest floor. It is the world's longest suspended canopy walk. The 530 - meter suspension walk is located 40 meters above the forest floor. The view offered from this canopy is astonishing and if lucky enough animals can be spotted. Overnight stay: After sunset, set out to the hides to watch nocturnal wild animals. Do not forget your torch light and binoculars. Camping: Set up your own tents and experience the wild. Equipment can be rented too. Remember to camp only at the approved sites. The nature trails of Taman Negara are world-renowned. Choose and explore some of the trails with different levels of difficulty. Lubuk Simpan trail: This is the most popular trail and is about 10 minutes walk away from Kuala Tahan. Negeram trail: This trail is about 4.1km and you will have to cross the river. Palas trail: This trail is about 1.6km and is fairly flat in nature. Kelah fish Sanctuary: The fish here can be fed with food that is bought from the Rangers. Enjoy the fish nibbling your feet as you stand bare feet in the river. Lata Berkoh and Waterfall Cascades: This is a famous spot for swimming in clear and cool waters. A boat ride from RM160 can take you to Lata Berkoh. The boat ride by itself is a unique experience. En-route Lata Berkoh you can stop by the Kelah Sanctuary. Tahan wildlife observation hide: You may get to see some wildlife at the salt lick if you stay overnight. Orang Asli settlements: Orang Asli refers to original people in Malay. The Orang Asli live a nomadic lifestyle in Taman Negara. You can find their settlements along the trails. A few of these settlements are accessible by boat. There is a range of accommodation available at Kuala Tahan. The choice ranges from wilderness to cozy resort-styled facilities. Hostels, bungalows, chalet, etc are all built with timber and fit well with the adjoining atmosphere. In spite of the isolated location, the facilities offered at Taman Negara are quite sophisticated. Hides are also available for accommodation. with bunks for comfortable overnight stay. These hides are rural structures located next to swamps rich in minerals. Good floating restaurants provide good food; they serve local delicacies, which include toast bread with kaya jam. Sirup Bandung is a local drink, a blend of rose syrup and milk. 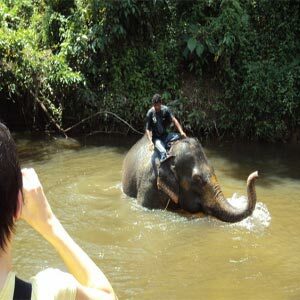 Taking a bus or train to Jerantut, a bus or taxi from Jerantut to Kuala Tembeling and then a boat from Kuala Tembeling to park headquarters at Kuala Tahan is the best way to reach Taman Negara. Buses are also available from Jerantut direct to Kampung Kuala Tahan. You can also drive down to Kuala Tahan but the boat ride from Kuala Tembeling to park headquarters at Kuala Tahan is the best appeal of Taman Negara. Jerantut, a town in Pahang, is the main entry point to the park. By Road: The journey takes approximately 3 - 4 hours from Kuala Lumpur or Kuantan. By Rail: The train service run by Keretapi Tanah Melayu Bhd (KTMB) is available. By Air: Flights are available from Kuala Lumpur. If you want to reach the park from Jerantut, you have to take the river. The 3 - 3 1/2 hour ride upstream Sungai Tembeling is an adventure by itself. The best time to visit the park is during the dry season from February to September. Rainfall is not continuous during the rainy season, but when it rains it rains pretty heavy, and the trails get difficult to tread on. The peak tourist season is from April to August. Do not enter the park without an entry permit. Do not disturb animal habitat or hunt any animal. Do not use any buildings in the park without obtaining permission. Do not take photographs without prior permission. Do not fish without prior permission. Explore the park with the help of a guide lest you lose your way.